Patriarch Kirill described the party system as "transforming the society into different parts with different political orientations"
MOSCOW, January 31. /TASS/. The Russian Orthodox Church (ROC) will never support any political forces, Patriarch Kirill of Moscow and All Russia said in an interview with reporters timed to the 10th anniversary of his enthronement. "Of course, one should not expect us to support some political programs or certain political forces, either pro-government or opposition ones," he said, stressing that the Church would "by no means turn into a political force serving the interests of part of our people and part of our society." The patriarch stressed that he opposed the society’s division into parties, describing the party system as "transforming the society into different parts with different political orientations." "Many believe that is good and right arguing that this is in line with the diversity of human choice. I will refrain from commenting on the issue, but I am not a proponent of dividing people into parties," he said. 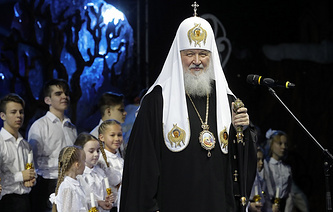 According to Patriarch Kirill, the Church, for its part, tries to reach a consensus on the most important issues for society openly speaking about its stance, in particular, on abortion.